We love this salsa and I love, love, love cilantro! This salsa has a ton of cilantro! I love the convenience of being able to have fresh salsa anytime I want...and not having to wait until the summer when good tasting tomatoes are available. The cilantro and vinegar make this salsa unique. 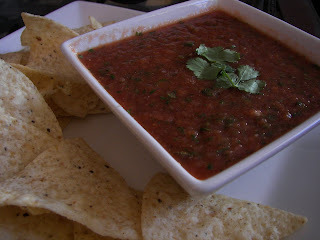 I received a version of this salsa recipe from the wife of one of my husband's colleagues. We went to their baby daughter's baptism. After the baptism there was a party at their home. 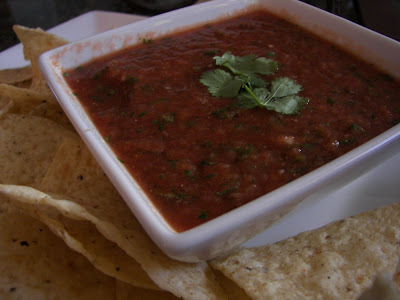 We sat down at the appetizer table and when we tasted this salsa, we didn't want to leave. My son said, "Mom, we NEED this recipe! " (Yes, we are foodies!) We made a batch of this yesterday and it is gone! Put tomatoes, cilantro leaves, onion, garlic, and jalapeno pepper in food processor. Process for 10 seconds or so, depending on how small you want the vegetables. Then add vinegar, salt, and pepper. Adjust vinegar and salt to taste. Our nephew Kurt has been in Mexico on a mission for our church for the past two years! He comes home this week. We are making the four hour drive to see him at his homecoming. This recipe is a hats off to Kurt for his service. He has loved the people and also the food! Grandma asked him to bring home recipes! Yum! Salsa never lasts long here- Allie can eat a batch by herself!